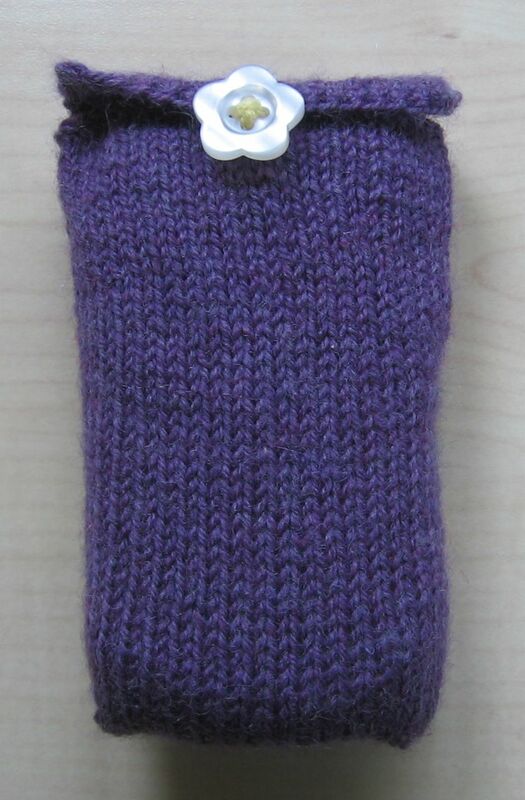 A friend asked on Facebook if anyone knew where she could get a cover for her new BlackBerry phone or would be willing to make one for her. I thought, "I could do that", nearly chickened out, then offered anyway. The criteria were that it should be purple and have a flower button on. I started Tunisian crocheting it and even thought that the reverse side of simple Tunisian stitch looks kind of blackberryish, then realised that the ball of yarn I was using would not be anywhere near enough to make it that way, so I frogged that and started knitting it in stocking stitch. Part way through doing that I found some more of the same yarn (grr!) but decided to stick with the second version. The yarn was left over from a cardigan I made DD some years back and I lined it with some material I acquired from the (previously-mentioned) old lady's stash. The only purchase was the button, which I bought for 25p at KPound Plus by Church Street tram stop. The recipient insisted on paying, although I would have made it for the price of the button! I have delivered it to her sister, who will be visiting her tomorrow. I hope she likes it! I have shown it here with my (not BlackBerry) phone inside to round it out a little. I did think I had made the top flap a bit too short, but the sister bought her another cover which has two motifs on a dangle, one of which is going to be sewn onto this cover, so perhaps it is just as well I left a bit of space for that.